[miau] The Frankie Dettori slot machine is a slot machine based on the well known ex champion jockey Frankie Dettori. Frankie Dettori romped in the celebrity Big Brother House with a second week eviction. His success led to an online slot machine by the name of Frankie Dettoris Magic Seven. 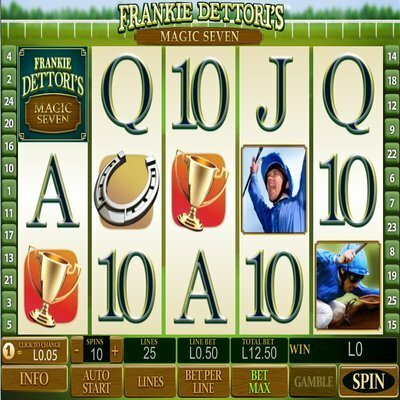 This slot machine game is based around horse racing that is built around Dettori and his horse racing career. The name itself is based on the number 7, which is considered a lucky number in the gambling world. It was also lucky for Frankie who won all seven races in a single day. Magic seven features the traditional horseshoe symbol, which is also considered lucky. Many players continue to experience high payouts and consistent wins while playing the Magic 7 slot machine. This slot machine offers 25 line slot, 5 reel with the object being to gain winning combinations. There is a photograph of Dettori that represents the wild symbol, and it can easily be replaced with other symbols in the game. The scatter symbol is the main title icon, and getting two or more of these symbols will guaranteed a payout that is multiplied by the total bet. It will also be added to active payline winnings. If a player gets three or more scatter symbols at the same time, they will automatically trigger free games races. The funnest part about the Magic Seven Slot machine game is the free game races. The free game races feature triggers a racetrack, which allows the gamer to choose their horse. The horses position determines the amount of free games that are won. First places gives 35 free games, second place gives 15 free games, and third place gives 10 free games. The Magic Seven Bonus round gives players a magic seven bonus round. This bonus round will appear on active reels 1 and 5. To pick up random prizes, the slot machine will see the player choose spots somewhere on the racetrack. There is a gamble feature that is activated once the player wins. This feature allows players to gamble their winnings for a chance to increase them. Players have the option to play or collect, which is what makes this slot machine an exceptional one to play. The Magic Seven gives players options, which is what makes this online slot machine stand out amongst the rest.